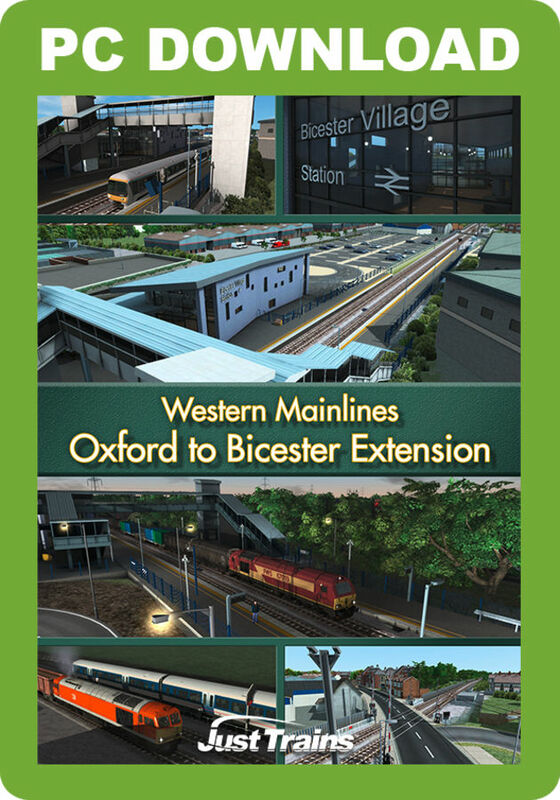 Western Mainlines - Oxford to Bicester Extension - 英国线路 - 铁路工厂中文资源网 - Powered by Discuz! This route extension for Just Trains' Western Mainlines add-on features the latest Integrated Lightweight Signals, accurately detailed stations (two with interior modelling), numerous custom objects and buildings and a set of 14 scenarios using a variety of rolling stock. A new set of textures for the default Class 166 DMU is included as well as all the wagons from the Just Trains VKA/VGA Wagon PlusPak for use in some of the freight scenarios. Drive on the newest line on the UK rail network! The Oxford-Bicester line was opened in October 2015, superseding the previous single track with 100MPH-capable dual track and employing the latest Integrated Lightweight Signals (iLS). All the previous level crossings except the one at London Road, Bicester, have been closed and have been replaced with bridges. The two stations at Bicester Town and Islip have been totally rebuilt and a brand new station called Oxford Parkway has been built to the north of Oxford. These three stations are state of the art, and Bicester Village station (as it has been renamed) and Oxford Parkway employ amazingly light and airy architectural designs. Take this service from Oxford to Bicester, where a relief driver will take over. As the line between Paddington and Reading is closed for engineering, this service has started at Marylebone station. Take over the train at Bicester and continue on to Swindon. As the line between Paddington and Reading is closed for engineering, this service has started at Marylebone station. Take over the train at Bicester and continue on to Bristol. Drive through the Bicester COD sidings, preparing a train for mainline movement. Take a Class 67 from Didcot to Bicester MOD on a cloudy morning. Collect and shunt today’s MOD trip working. Shunt and prepare a train for pick-up from the exchange sidings. Drive the afternoon MOD tripper from Bicester to Didcot. Take a 165 unit from Bicester to Oxford Parkway on a cloudy evening. Drive 6M06 from Didcot to Oxford Banbury Sidings. Includes 14 standard and 1 Free Roam scenarios. Route is Quick Drive enabled. GMT+8, 2019-4-23 12:10 , Processed in 0.218750 second(s), 19 queries .